Are you overwhelmed with the amount of numbers in the weighting and choosing phases? In this next example, we have used a qualitative method of weighting that is easier for leaders who are not mathematically inclined or are unable to juggle and balance several numbers in their heads. Frontloading involves asking questions before the activity or learning experience that allow clients to change their behaviors in the experience. 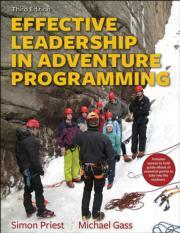 Goals and objectives form the foundation for all lessons taught in adventure programs. Setting goals and objectives is critical to outdoor leaders and almost as important to clients. Indeed, ethical standards have limitations. Ethical guidelines may conflict within certain cultures, requiring you to adapt them in such instances. Is Adventure Programming a Profession?